Smaug gets in your eyes. The second installation of The Hobbit trilogy is pretty watchable, even if you're not eight years old. Directed by Peter Jackson. With Martin Freeman and Benedict Cumberbatch. Opens Friday. Where were we? Oh yes, of course, in The Hobbit: The Desolation of Smaug, the second part of a trilogy fashioned from English author J.R.R. Tolkien's prequel to his The Lord of the Rings. The title character and diminutive Middle-Earth hero Bilbo Baggins (played by Martin Freeman) is accompanying Gandalf the Wizard (Ian McKellen) and a determined band of Dwarves — including the intrepid Thorin Oakenshield (Richard Armitage) — on the inevitable, perpetual, frustratingly indecisive quest to ... wait a minute ... reclaim their legendary ancestral home of Erebor from a horrible fire-breathing dragon named Smaug (voice of Benedict Cumberbatch). The quest takes two hours and forty-one minutes, counting screen credits, and is a wondrous thing to behold if you're eight years old. If you're not, it's still pretty watchable on a wintry Sunday afternoon with a sack of popcorn and a little bit of goblin wine — on the biggest screen with the biggest sound system imaginable. Director Peter Jackson and his regiment of helpers — Jackson wrote the screenplay with Philippa Boyens, Fran Walsh, and the busy Guillermo del Toro — decorate the property with the finest artwork money can buy. The lobcockled Laketown, spidery Mirkwood Forest, and Smaug's murky subterranean kingdom under Lonely Mountain are exceptionally well crafted, and the supporting cast is pitch-perfect, notably Luke Evans as Bard the bargeman, Orlando Bloom as Legolas the Elf prince, Ryan Gage as a governmental toady called Alfrid, and Canadian actress Evangeline Lilly as Tauriel, the red-haired elfin bow-hunter who supplies the missing Cate Blanchett/Liv Tyler pugnacious-immortal femininity. Bilbo has got the Ring. He only slips it on his finger in emergencies, such as when he's being chased through Smaug's cavernous, gold-filled basement and needs to become invisible. He doesn't get those headaches the Ring once gave him — actually all that's really in the future; hard to keep that in mind — but the effect is trippy. The Ring is both a blessing and a curse, but name us something that isn't. Out on the road, Bilbo and his Dwarf buddies suffer from familiar hippie troubles: getting lost, monsters that pop up out of nowhere, depth perception problems, lapses in judgment, etc. As Gandalf sees it, "The very air is heavy with illusion." 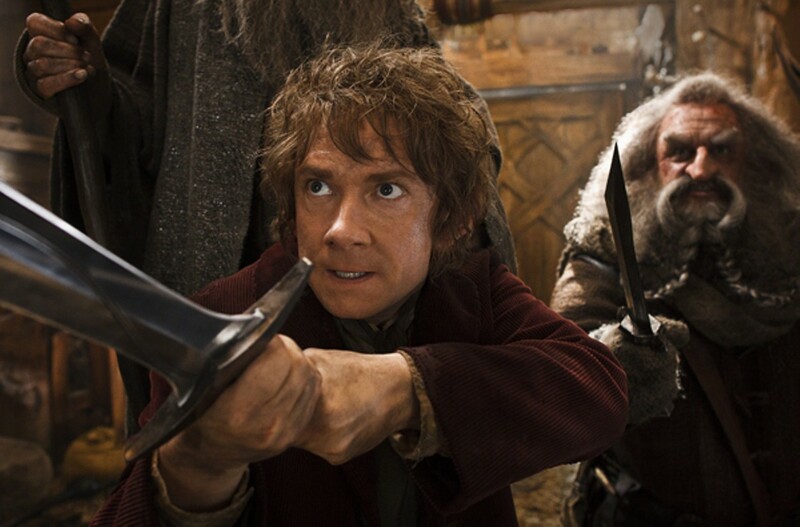 But the increasingly haggard and care-worn Bilbo soldiers on. Freeman's cheerful physical comedy in two-shot with the Brobdingnagian Smaug reminds us of Buster Keaton. A question arises: Do the Dwarves eat anything for dinner besides milk and cookies? Mysteries make life worth living. Perhaps Bilbo and his mates will never, ever find whatever it is they're searching for. Maybe the series will go on forever. Would that be such a bad thing? The Hobbit: The Desolation of Smaug is not showing in any theaters in the area.